Dave, help! My PC keeps on hanging in every interval. It shows an error that “your system is running with too little virtual memory”. What troubleshooting can I do and what fix can I apply to make my PC run without any obstacles? I’m going to assume you’re running Windows XP, and seeing a message stating “Your system is low on virtual memory. Windows is increasing the size of your virtual memory paging file.” Unless you have very little physical memory (RAM) in your system, this message is indicative of a buggy application with a memory leak. A memory leak is a common problem caused by poorly written or poorly debugged applications where they continually use more and more memory until you shut down the program, end the process manually or restart Microsoft Windows. Virtual memory, also known as a page file or swap file, is a file on your hard drive (C:pagefile.sys by default) that Windows and applications use in addition to physical memory (RAM) as needed. The default and recommended size of this file is 1.5 times the amount of physical memory. Virtual memory is the sum of physical memory and the page file. So if your computer has 512 MB RAM, it will have a 768 MB page file by default, for a total of 1.25 GB of physical + virtual memory. 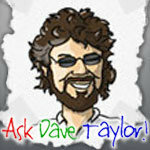 Ask Dave Taylor ask dave taylor, microsoft windows. permalink.